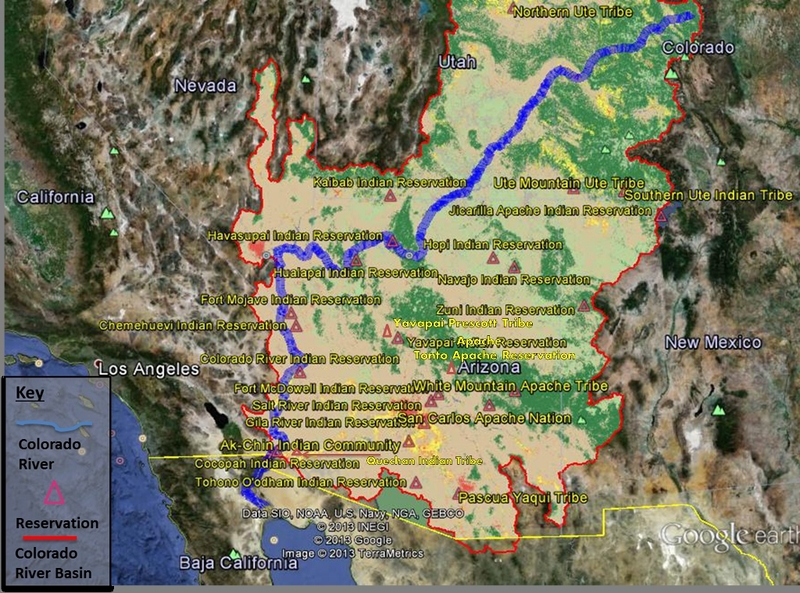 “The Colorado River itself rises in the mountains of Colorado and flows generally in a southwesterly direction for about 1,300 miles through Colorado, Utah, and Arizona …after which it passes …empties into the Mexican waters of the Gulf of California. On its way to the sea it receives tributary water from Wyoming, Colorado, Utah, Nevada, New Mexico and Arizona. The river and its tributaries… drain 242,000 square miles, an area about 900 miles long from north to south and 300 to 500 miles wide from east to west- practically one-twelfth the area of the continental United States excluding Alaska. Much of this large basin is so arid that it is, as it always has been, largely dependent upon managed use of the waters of the Colorado River System to make it productive and inhabitable.” Arizona v. California, 373 U.S. 546 (195).